While it actually can truly be lots of fun, be prepared to be exhausted before you even get to the beach. Summer is upon us, and there's nothing quite like the joy and fun of a day at the beach, especially with kids. Insert sarcasm here. While it actually can truly be lots of fun, be prepared to be exhausted before you even get there. Check out these 25 steps and you'll see why. 2. Realize that one of them has not gone pee yet. Wrangle them out of their suit. Wait 20 minutes for them to pee. Re-wrangle them into their suit. 3. Time for the dreaded sunscreen. Begin to apply sunscreen. 4. At least one child will rub sunscreen in their eyes at this point. It's almost inevitable. 5. Run for a wet cloth to wipe sunscreen out of their eyes all the while listening to said child screaming like a banshee. 6. Continue applying sunscreen, being extra careful to avoid all open orifices. We may never get to the beach otherwise. 7. Time to pack the wagon. Packing the wagon is more like a game of Tetris than anything, trying to get it all to fit. Only not nearly as fun. 8. Pack the sand toys. The rule of thumb is you can never have too many. The only real kicker is that when you get to the beach they will just dig with their hands anyhow, but at least you're prepared. Right? 9. Pack lawn chairs. You won't be needing these. But they are nice to have just in case. 10. Pack a beach umbrella to keep the little ones out of the sun. If I could just get them to stay still long enough. 11. Pack a floatie, or five for good measure, never mind the fact that you don't have five kids. 12. Pack a book for yourself that will never see the light of day. But hope springs eternal, and all that. 13. Bring the very full wagon into submission with a bungee cord or two that you spend 15 minutes searching for in the shed. 14. Realize that you have nothing for the kids to eat at the beach. Ugh, really? They want all this and to eat too?! OK, fine. 15. Take the bungee cords off of the wagon. 16. Pack a cooler full of drinks, cheese strings, granola bars, rice chips, snack packs, fruit, regular chips, and the kitchen sink. (Well they'll need to wash their hands somehow won't they?). 17. Remember that your youngest is still in diapers, and you haven't packed any of that crap yet. Throw in the whole diaper bag rather than take the extra time to sort through for what you need. Accidentally forget a second Little Swimmer, so that when your child goes into the water a second time in a regular diaper, their diaper swells up to 10 times it's normal size. Not even kidding: 10 times. 18. Re-pack the wagon, this time including a cooler and diaper bag. Reapply the bungee cords. It is treacherously full now. Reminds me strongly of the sleigh in "How the Grinch Stole Christmas." 19. Get second wagon ready with pillows and lovely soft blankets in it to transport the children. Must be nice! Hire second person to pull one of the wagons. 20. Pull wagons half way down the road to the beach. 21. Realize you've completely forgotten the towels. 22. Return to the cottage for the towels. Are we enjoying ourselves yet?? 23. Pull wagon to the beach. Worry because it's taken so long that the sunscreen must be starting to wear off soon. 24. Accidentally dump entire contents of wagon carrying the stuff in it into the creek near the beach. It's just so very top heavy. Thank goodness it was just the cargo wagon. Put the wagon upright again. The bungee cords helped a bit at least. 25. Arrive at beach, and now to relax. Tricked you! There will be no relaxing for you! You have young kids and you're at the beach! Prepare to follow your little ones around as they alternatively swim and then roll in the sand, over and over. Don't take your eyes off them! When you're done, do steps one to 25 in reverse order to get home from the beach. 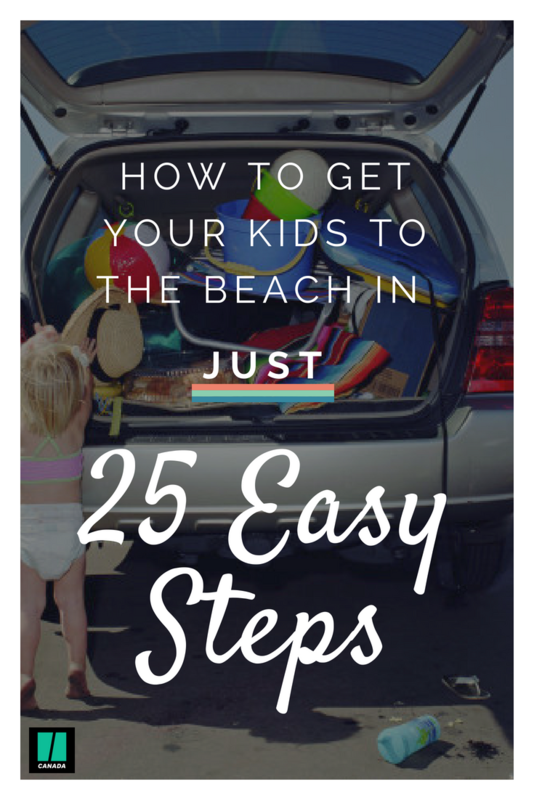 Add one more step in which you allow the children to pack every rock and stick that they've found on the beach into the already overloaded wagon, because we of course don't have any sticks and rocks back at the cottage. Draw the line at frogs and dead fish. Tomorrow, repeat this process. Enjoy your holiday!